I finally had a nice spring day to take some pictures and was impressed by the color and sharpness, even shooting with the macro setting. 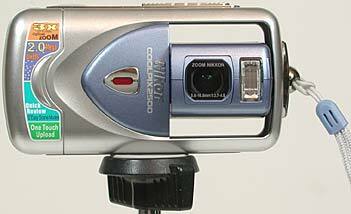 Look at my CoolPix 2500 Portfolio. 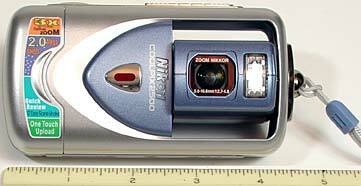 The camera is capable of bright, sharp images, worthy of the Nikon name. But the physical design can work against you if you're not careful. Initially I found it hard to hold steady. There's nothing to rest against your eye when shooting. As with most digital cameras, only holding it with two hands is possible. The Xtend-a-View can fix this if I get it adapted with a longer elastic strap. I picked up the 2500 a couple of weeks ago for those times I don't want to bring the 5000 with me. I've gone on 2 trips and found the camera to be better than I had hoped. The build quality is good, the pictures are turning out very good, it easily fits in a pocket, and it works good just in auto mode but with all of the scene settings I'm getting some very good pictures. The battery life has been terrific also. The only 2 drawbacks I've found are - no viewfinder, but the LCD is easy to see and the focus on the camera is very accurate - no slideshow playback mode, I like to use that when people want to see my pictures, you just have to show them how to scroll through the picturess. I've owned a Canon Elph s100 and Canon A20 for small portable cameras and the 2500 far outperforms either one. Ships with NikonView 5 but I WON'T install it so don't ask me anything about the software. Seems to have infrared sensitivity. I tested it with the 88A and it has interesting possibilities.